We decided we will do the south coast of Vieques, turn around the east coast and do a bit of the north coast before going up north to Culebra. A good part of Vieques has been out of bounds for cruisers and tourists until 2003 because the US Navy used this island for their bombing exercises. The result is an island that is still undeveloped with very little tourism. As many say, a very well kept secret. It is very close to the US and British Virgin Islands which are quite the opposite. It is said that the beaches are among the top beaches in the Caribbean, the sand is white and the water is amazingly clear, we are definitely going to check that. Our first stop is Punta Arenas in western side of the island. There is us, another cat and a very long white beach. We go snorkelling and we can't believe the amount of conch in the shallow waters next to the beach. So now we know what we’ll have for dinner! At night Oscar goes diving in search of lobster but he finds what he calls a ‘turtle hotel’. Many turtles sleeping in little caves. We met Hyde, June and son Joseph from the other cat, Windflower, they are Australians, but they are going the other way, back to the US. Not surprising the weekend gets crowded with fast boats coming from the east coast of Puerto Rico as this nice place is just 12 miles apart. Just 7 miles to the east is Puerto Real in the town of Esperanza. Here we find some tourists, the anchorage is rolly but the holding is good. We just stayed a couple of days. By the time we got to our next stop it was squally again, it seems that squalls were following us every time we needed to look for anchorage. There was again a bit of a discrepancy with C-map charts for one of the reefs, and again we followed Bruce's guide to anchor in a wide, well protected bay at about 4 meters depth. We are in this protected area, waiting for a forecasted tropical wave with high winds in squalls (30-35 kn). This is another beautiful and unspoiled place with good anchorage, free moorings and a very nice beach. We relaxed here for a couple of days, this was the last stop before turning the island to visit part of the north. At this point I feel I had enough of solitude and isolated places and I’m looking forward to a bit more ‘civilization’ around me. Turning the east tip of Vieques we find an amazing place. It is hard to believe this was used for bombing exercises. We enter thru a cut in the coral and find good anchorage. It looks promising for diving and Oscar has selected all the places he wants to dive for lobsters. But it just doesn't work. Very early next morning we are waken up by a voice in a megaphone calling for 'the catamaran'. The guy calling is saying we have to leave immediately, the bomb cleaning squad is about to go to work. They are cleaning the area of possible explosives. There is no way we are going to argue with that, we quickly get ready and leave. So does the only other boat that was in the anchorage. It is a disappointment but we decide to get to Culebra and close the chapter on Vieques. Culebra is a beautiful place and life here goes at very slow pace. 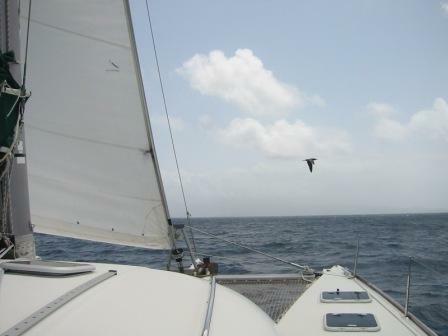 It is more popular for cruisers than Vieques. Some of our friends from Puerto Rico are here. Others have come here and stayed permanently. Some seem to live semi-permanently in the bar drinking beer. Same type of cruisers we found in Boqueron and in Dominican Republic. They don't seem to be 'cruising' much. Somebody recommends a wi-fi antenna that one of the cruisers sells for 100 dollars, we decide to try, it is not directional like the netgear we have and seems to be working pretty well, so we have internet from the boat. There is a small town where to buy supplies and beautiful beaches all arround. 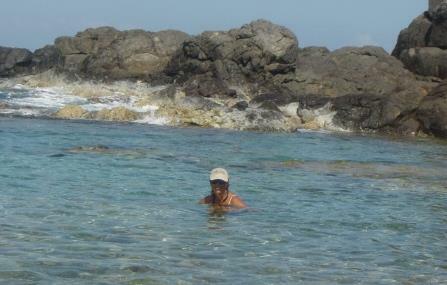 It is a small island and Culebrita, the little Culebra, is not far so we go around and stay in several places. 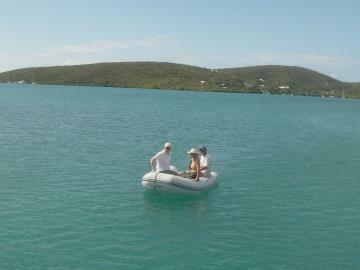 Culebrita is outstanding and there are several free moorings to stay overnight. Our friends Donna and Austin arrived from New Jersey. They are coming to Culebra for a week after we convince them this is a perfect place to celebrate Donna's birthday. This time they are staying in a nice resort. Donna is saying that she likes to sleep in a bed that doesn't move and a room that doesn't have strange noises at night!. We understand perfectly. We had a great time in Saint Martin when they visited two years ago and stayed with us on board Zenitude. We planned a fantastic day sailing around the island including a visit to Culebrita but the weather does not cooperate and we get into a squall with 30 knots winds. Our guests are not happy. Donna gets really scared and we decide to go back and have a quiet afternoon at a quiet anchorage. They will visit the beaches tomorrow by car. Oh well, cruisers' life is tough. We ended up having a great time on land and celebrated Donna's birthday with a good dinner! Our friends leave and it is time for us to keep going as well. Next stop, Saint John, US Virgin Islands. We've heard wonders about a bio bay and we decide to give it a try even if the entrance is tricky and shallow. We entered at the worst possible time with wind from the back in a squall. Oh, well, we made it. Inside it is very calm. We go for a dingy ride while we wait for the night to fall, it is a nice place with little beaches among mangroves. The night comes and we see the fluorescence in the water. After we come back to Zenitude and look up the sky it is an amazing sight, in the very dark moonless night the stars are brilliant, a magic night.